Headings provide the flexibility to group accounts in your Chart of Accounts. 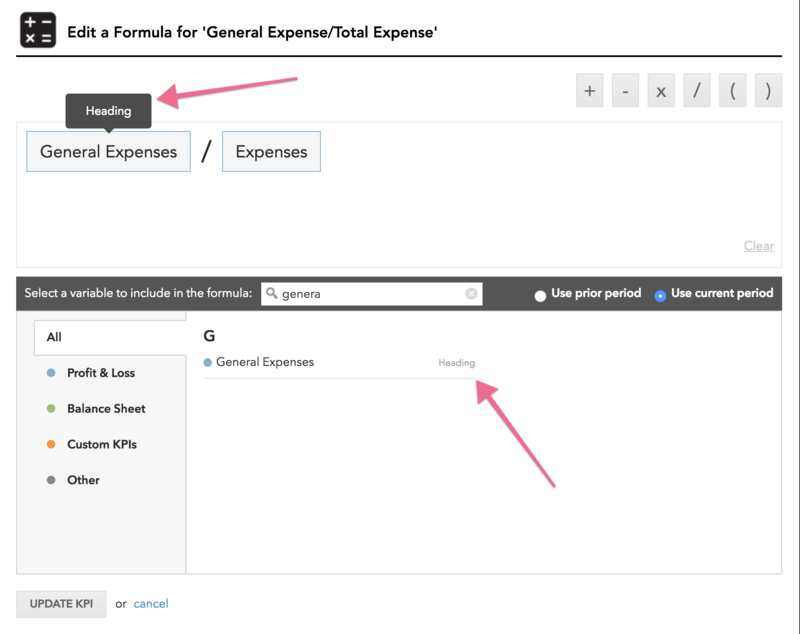 For example, you can add a heading called ‘General & Admin Expense’ to group accounts under this heading. Grouping accounts creates structure and hierarchy, which flows through when viewing your financial statements in the analysis tools and reports. You can then collapse and expand headings to show different levels of detail. A subtotal will be shown for every group. You can have an unlimited number of accounts under a heading. Hover over an existing header account or classification. An option to ‘Add heading’ will appear. This heading will be created underneath. Select the accounts you wish to group by ticking the boxes on the left, and then click ‘Create heading’ at the top of the page. Note: You are only able to create up to 2 levels of headings. For example, a heading which includes a subheading. Reclassifying headings and subheadings will affect all accounts contained within. This can be done by using the drag and drop method, or by selecting the heading and clicking ‘Reclassify’ at the top of the screen. Accounts will retain their top-to-bottom order when reclassified. To delete/remove a heading, simply hover over the heading and click the three dot icon. Alternatively, transfer all underlying accounts out of the heading, and click 'Save Changes'. Any headings that are empty will be automatically removed. Creating headings and subheadings in Step 3 - Chart of Accounts will allow you greater clarity when using the analysis and reporting tools. There are a number of functions within Fathom where headings are useful. 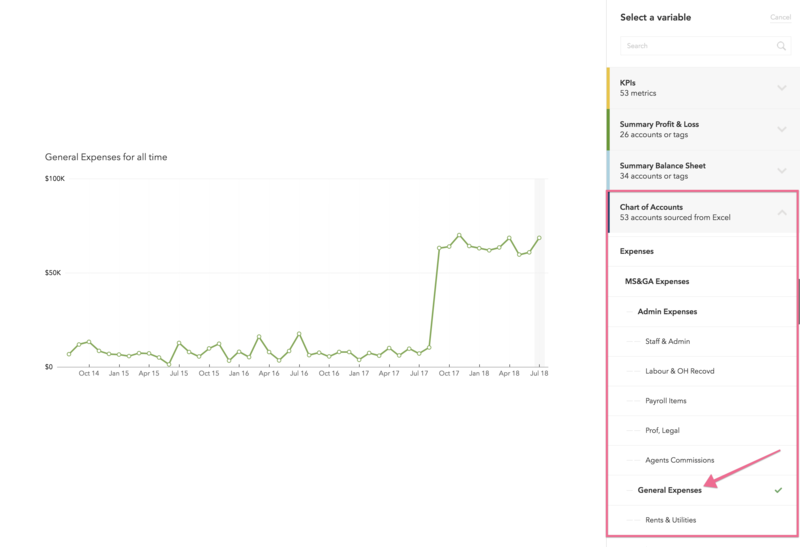 You can select headings as 'Account Watch' KPIs. This enables you to track any heading from your chart of accounts as a KPI. You can reference headings when creating Formula KPIs. This will automatically aggregate the accounts within the heading when calculating this Formula. When selecting accounts, Fathom will automatically indicate if the account is a heading, account, or KPI. Note: Any accounts that are added to or removed from a heading will be reflected in the calculation of any Formula KPIs that include this heading. In the Report Editor, you can reference headings from the variable selector for various components, under 'Chart of Accounts'. Your accounts will be presented in the same structure as in 'Step 3 - Chart of Accounts' of the setup process. You will be able to select any headings for display in your charts and graphs. You can also use headings in your commentary placeholders. When editing your financial statements, you are able to select to show more or less detail. This will summarise the financial statement, by collapsing or expanding headings and sub-headings. This provides further flexibility over the presentation of your financial statements.